Functional MRI is a noninvasive diagnostic test that measures small changes in blood flow as a person performs tasks while in the MRI scanner. It detects the brain in action (e.g., speaking or moving). It has an advantage over other imaging studies that focus only on the structure of the brain. Diffusion tensor imaging (DTI) detects the white matter fibers that connect different parts of the brain. These imaging studies help to map specific brain areas before surgery. How does functional MRI work? When we start thinking, neurons in our brain use more oxygen and demand more blood. Functional magnetic resonance imaging (fMRI) can detect the difference in signal caused by the increase in blood flow to specific areas of the brain. The MRI scanner measures this signal difference and displays the activity as a colored area (Fig. 1). Diffusion Tensor Imaging (DTI) is a technique that detects how water travels along the white matter tracts in the brain (Fig. 2). White-matter tracts connect different parts of the brain and must be protected during surgery. 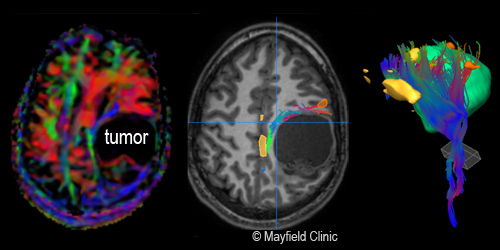 These imaging studies are important in planning surgery – called brain mapping – that helps surgeons remove tumors to the greatest extent possible without harming areas that are critical to a patient’s quality of life (Fig. 3). A dye (contrast agent) may be injected into your blood stream. The dye contains gadolinium, which has magnetic properties. It circulates through the blood stream and is absorbed in certain tissues, which then stand out on the scan. Figure 1. In functional MRI, brain areas “light-up” when performing certain tasks. Figure 2. In diffusion tensor imaging (DTI), each color represents a different white matter pathway. Figure 3. 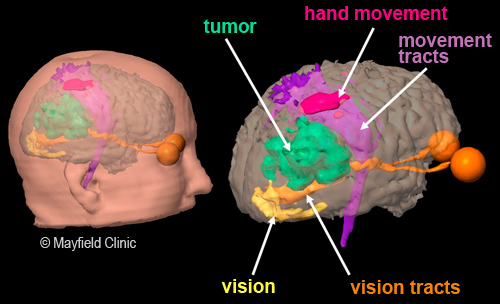 A 3D reconstruction from fMRI and DTI images shows the vision and hand movement areas that lie close to the brain tumor (green area). What does a functional MRI show? Functional MRI gives detailed pictures of brain activity. It is used to determine precisely which part of the brain is handling critical functions such as thought, speech, vision, movement and sensation. It can also show the effects of stroke, trauma or Alzheimer's on brain function. A radiology technologist will perform the test in the MRI suite of the Radiology department of the hospital or outpatient imaging center. Avoid wearing jewelry and metal, and remove credit cards. Bring any relevant X-rays, CT scans, or previous MRI exams. Bring your insurance identification card if you have one. You will lie on a moveable bed with your head cradled in a headrest and your arms at your sides. An antenna device called a “coil” will be placed over your head. You may be given earphones to wear. Small markers called fiducials may be placed on your forehead, face, or behind your ear. Fiducials look like lifesavers and assist the surgeon during image-guided surgery. Do not remove or get the fiducials wet. When you are comfortably positioned, the table will slowly move into the magnetic field. First, an anatomic scan is performed. You must lie still. As the exam proceeds, you will hear a muffled “thumping” sound for several minutes at a time. This is the sound of the pictures being taken. Finger tapping: You will be instructed to tap your thumb and fingers in one or both hands. Word generation: When you see a letter, think of a word that starts with that letter. Do not say the word out loud. Verb generation: When you see a noun, think of a verb that is associated with that noun. Do not say the word out loud. Sentence completion: You will see a sentence with a blank. Think of the word that completes the sentence. The exam usually takes 1 to 2 hours. It is important that you relax and lie as still as possible. Any movement during this time will blur the picture. You may be given an injection of contrast dye into your arm or through an IV to enhance the images. After the test is complete, you are free to go. You may be told to drink lots of fluids to help your kidneys remove the contrast dye from your body. There are no known health risks associated with the magnetic field or the radio waves used by the machine. Some people are sensitive to the contrast agent and may develop an allergic reaction. All contrast agents are FDA-approved and safe. Be sure to tell your doctor if you have diabetes or kidney problems. A kidney function test may be needed prior to the MRI to make sure your kidneys are able to clear the contrast agent from your body. Any metallic substance on your body can affect the quality of the images. It can also cause discomfort or injury to you when placed in the magnetic field. You should also tell your doctor if you are pregnant. The American College of Radiology recommends that MRI scanning not be done in the first trimester. A neuroradiologist will analyze the fMRI and DTI results. Treatment plans can be based solely on these results, so it is important that the results are as accurate as possible. The radiologist will promptly review your results with your referring doctor, who in turn will discuss the results with you. If you have further questions about this diagnostic test, contact the doctor that ordered the test or visit www.radiologyinfo.org. contrast agent: a liquid (usually iodine or gadolinium) that is injected into your body to make certain tissues show up clearly during diagnostic imaging. gadolinium: a type of contrast agent used during MRI. MRI (Magnetic Resonance Imaging): a diagnostic test that uses a strong magnet to view tissues in your body and displays them in a series of "slices." In neuroscience, a picture is worth a thousand words. Maybe more. At Mayfield, we work with all diagnostic imaging providers in the Greater Cincinnati / Northern Kentucky area to obtain images of the brain and spine and interpret them with expertise and care. Patients and referring physicians can rest assured that we will lay the groundwork for a diagnosis of utmost accuracy.